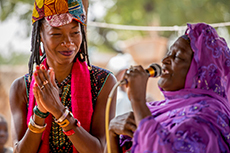 The vibrant documentary MALI BLUES follows four artists: Fatoumata "Fatou" Diawara is a rising star on the global pop scene (memorably featured in Abderrahmane Sissako's acclaimed drama Timbuktu). Bassekou Kouyate is a celebrated ngoni player and traditional griot. Master Soumy is a young street rapper influenced by hip-hop. 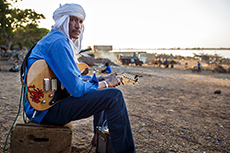 Ahmed Ag Kaedi is the leader of the Tuareg band Amanar and a guitar virtuoso. Each combines rich musical traditions with contemporary influences, using their music to stand up to extremism and inspire tolerance and peace. About Mali's ancient culture, and this culture's position in the country today. Exposes tensions in a society assailed by modernization, Islam and global tourism, yet confident that it will maintain its own distinctive character. This is the story of Komusa Tenapo, master mason and heir to the secrets of Djenne architecture, the traditional use of mud in Malian buildings.